In this episode, Caleb takes a look at the Konova K2 Slider, an affordable, high quality camera slider perfect for DSLR shooters. I’ve been very impressed with this slider. So much so, I regret purchasing my Cinevate Atlas FLT which is almost triple the cost but isn’t as smooth under heavier weight. While the FLT is VERY strong and well built, I found the K2 slider to be able to perform better under heavier kits. I enjoy mine as well Caleb. Great slider. I own this one and love it. i own the k5 and it is a more robust version. I have not yet tried the k2 version, but on the k3 version the friction varies greatly when the camera is not balanced (like when you sliding with the camera tilted, or change the angle of the slider itself) I think the larger wheels on the k5 prevent this and make it my go-to slide tool. 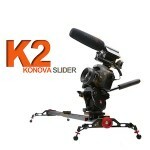 I am a slider addict and have tried several (even bought the edelkrone v2small) and i use this more than any other. Great review Caleh. I take this thing with me everywhere, the 39″ is just small enough to comfortable carry around a lot. Love my Konova sliders! Couple downsides – the rails build up a little rust over time (I use steel wool to polish occasionally) and the longer sizes do rock side to side when center mounted, just stuff to be aware of. I used the Tamron 24-70mm at 35mm on a 5DmkII. I have the shorter version and I was really disappointed whit it. The build quality is great, but any little dust on the rails makes smooth movements impossible. The friction control is also useless. I prefer non lubricated systems, such as dynamic perception one. the Konova and the slide you have linked to work in completely different ways. The konova is a rollerbearing slider where as the one you have linked to is a drylin friction slider. I noticed when you slid the camera back and forth the slider was rocking like a balance. Is that a desired feature? That is from the tripod. Not the slider. The tripod? Or the head? Well it doesn’t matter, I guess you just needed to tighten it more. This is k2 new version. I’d really love to hear a k2 vs k3 comparison, if possible. This seems like it would be a common issue, since the slider is built to be mounted in line with the tilt of a tripod head, instead of perpendicular. Caleb, any advice for mounting the slider perpendicular to the tilt of your tripod, so as to limit rocking back and forth with heavier cameras? What length is this slider Caleb is reviewing? Hey Caleb. Thank you for this honest review. Konova now offers K2, K3, K5 and K7. For the typical DSLR shooter who’s gear is not too heavy, do you suggest one over the other if smooth movement is of utmost importance?